Even though I grew up in Catalonia, my reference of weddings come from watching American romcoms and attending two weddings in England. Despite the fact that I am a hopeless romantic, I feel this tradition is closer to resembling a funfair than a spiritual ceremony and frankly, makes me cringe. Maybe this play was trying to raise this issue. Maybe not. The show is set in a wedding venue filled with cards, hearts and prosecco. It tells the story of a woman who is in love with her ex-boyfriend but about to marry her safe choice. From the set to the dialogue, there is lots about this show that feels realistic and familiar, but some of the plot is too stereotypical. It feels like watching the stage version of Coronation Street or Emerald. There’s nothing wrong with it, but it doesn’t say anything new and the Vaults, to me, should be a place to experience the most innovative and groundbreaking theatre. The actresses are good and it’s enjoyable watching a group of women with such a varied age range onstage. Two of the actresses multi-role as a 12-year-old girl and one of the male lovers, adding some interesting bits to watch. Next time I go to a wedding, I will go naked to see if a wedding can lead to a more extraordinary plot. 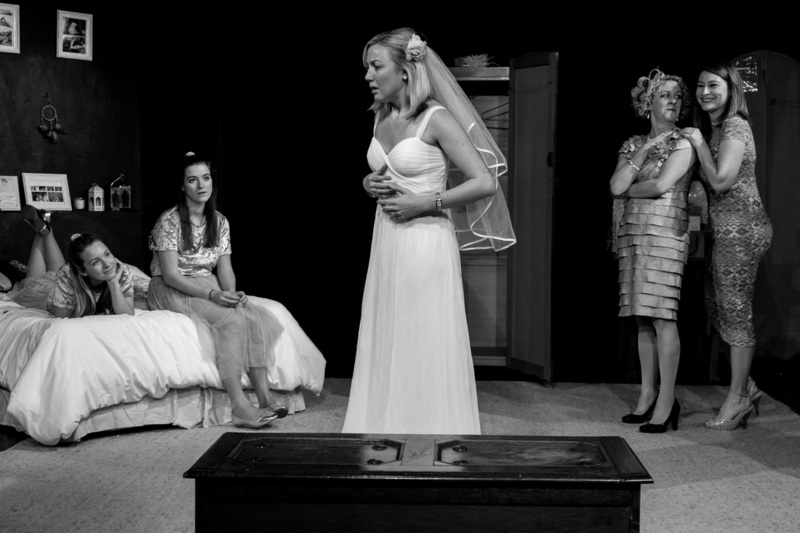 The Wedding Room runs through 4 March.